Home / Family Life / Kickoff Your Summer Cookbook FREE! Kickoff Your Summer Cookbook FREE! It’s here! Summer that is! I know everyone is looking forward to different foods and cook outs and all of the food and fun that go with them! I love this time of year. We always have fresh fruit and vegetables around and that means I have a lot to use in new recipes! Kraft is a brand I trust with my family and I always love their recipes. I think that summer time is the best time to try new recipes. You have pot lucks and parties and graduations to attend, I always want to bring something that is extra special that I know is going to taste fabulous! 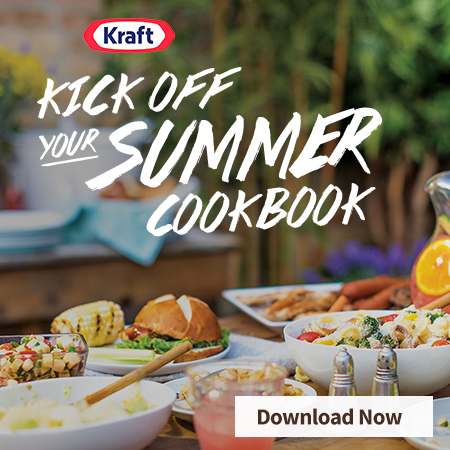 You can now download the new Kick Off Your Summer Cookbook for FREE! You always need new cookbooks, what better way to get one than to just download it for free! I especially love the Philadelphia Cream Cheese recipes, mixed with fruit you will always find a winner there! Nobody can resist fresh tastes of summer mixed with the best cream cheese! I love their PHILADELPHIA Fruit Pizza recipe, it is so good and fresh tasting, and I always get compliments! Thank you for sharing the information about this free cookbook! I found a lot of recipes in it that I want to make this summer! Starting with the fruit pizza…YUM!